Last week, the Christian world was shocked by the court conviction of David Cho Yong-Gi, founder and pastor of the largest Church in the world, South Korea's Yoido Full Gospel Church. You can read more of it at Gospel Herald, Christianity Today, Yonhap News, Huffington Post, and many others on the Internet. All of them have reported in a manner that mirrors shock and horror at how a prominent and quite respected senior leader to be charged and convicted in a court of law. After all, he is doing God's work right? Others like Bob Rodgers has attempted to supply some background information in order to set the record straight. By doing so, Rodgers has tried to assure the public that David Cho is not as bad as the press reports have made him out to be. Amid the social media feeding frenzy, many subsequent comments and articles have pointed out to the lack of accountability, the problem with megachurches, the temptation of riches, and the stumbling of fellow believers. I find something rather troubling about how people are suddenly distancing themselves from anything to do with David Cho, Yoido Full Gospel, or any churches or structures resembling the same. A former model and hero of the faith is suddenly ostracized and banished to the pits of the grave of respect. Probably, David Cho will go down the beaten paths of disgrace and embarrassment, just like Ted Haggard, Eddie Long, Vaughn Reeves, and others have gone before. I remember asking a prominent Christian book publisher about how the company protects their business interests in the event of one of their authors falling for whatever reasons. His reply was curt: "We have policies and contracts in place to deal with such issues." Later, I found out that the publisher has the right to terminate any links or obligations to authors who have been convicted in a court of law. It makes business sense. It is quite normal that sales of prominent personalities often take a tumble once a scandal arises.My question: How easy it is for anyone to turn from hero to villain on the basis of one single conviction? In the case of David Cho, the single word answer is: "Easy!" Just look at the many articles springing up and distancing themselves from the once oft-quoted pastor. Someone in Church came and said to me last Sunday about David Cho: "Many people will be stumbled." How can the Christian community respond? Let me suggest three things, using ABC as a acronym. The best way to begin the conversation is to admit the wrong done. Do not start going around trying to defend David Cho for a court conviction that has been deliberated and evidence-checked by highly qualified judges and a well established legal system. There are reasons why the judges are sitting there in the first place. Even David Cho has publicly confessed to some sort of an oversight and error committed. Anyone seeking to defend or justify David's actions ought to remember King David's attitude. When God used the prophet Nathan to tell King David about his adultery with Bathsheba, and subsequent sins. King David appeared very worked up about the evils of the rich man who abused his power on the poor man, only to be told that he was the rich man in the story. Note King David's response. It was a humble admission that exemplified the sensitivity of David's heart to God. In contrast, King Saul when confronted by the prophet Samuel about his act of disobedience, offered not a heart of admission but a statement of defiance. King David admitted his sin. King Saul refused to do the same. It is hoped that David Cho will admit any wrongdoing if he had done. Even if the reasons for the fall can be justified either way, it does not change the fact that one has fallen in some way. Acknowledging sin or wrongdoing is only one part. The other is to make plans to do something to prevent it from happening again. Here, it is important to learn from past mistakes and to prevent any future occurrences. A sign of a good Church turnaround after any scandal is not to cry over spilled milk but to mop up the mess, repair broken structures, and heal the wounds. The Prophet Nation delivered both good and bad news to King David. The good news is, God had forgiven King David. The bad news is, King David will be punished through the death of his first born son. It is a tough pill to swallow. That is why King David continued to pray and to plead for his son. Due to the seriousness of sin, God had to punish him. Setting up accountability levels is important so as to keep temptations at bay. I remember reading about Billy Graham who had pledged never to be alone with any other woman except his own wife. In his own biography, he wrote that he would never "travel, meet, or eat alone with a woman other than" his wife. Such an accountability level helps to preserve his integrity before God and people. The more prominent the leader, the more critical it is to have an accountability group. Whenever a scandal breaks out, it is easy for people to swing from acceptance to denial as if the person(s) in question has contracted leprosy. The example of Ted Haggard and his wife is a case in point. In an interview with ChristianityToday, Gayle Haggard shares that the reason why she wrote the book is also for the Church to learn to play their part in the exercise of love and forgiveness. That is so important. So often, Christian people ostracize and judge those who have fallen, and then distanced themselves so much with silence and disdain that one wonders where then is Christian love and forgiveness. Did Jesus distance himself from the sinners during his ministry? Did Jesus condemn the woman at the well? Did Jesus shun the robbers, the despised tax collectors, and even the people who persecuted him? No. He offered them the same word of salvation. "It's so easy for us to start distancing ourselves from those who have been convicted of some sort of crime or wrongdoing. Worse, some may even start putting themselves on some kind of a moral high ground, as if they will never commit such a crime. Truth is, temptation is real. Temptation does not discriminate from ethnicity, denominational or independent groups, clergy or laity, etc. When we admit that we are weak in ourselves, it simply means this: We will all break at some point. We will all succumb at a certain level of temptation. That is why we pray regularly, 'Lead us not into temptation, but deliver us from evil.'" Learn to create moments of graciousness in which we throw out judgmentalism and bring in compassion. Put aside prejudices and put on humility that we too may not be very different under the same exact circumstances. Learn to listen, and to offer ourselves as bridges to bring healing and forgiveness. Hate the sin but love the sinner, people say. Build bridges, not burn the sinner, I say. My readers, it is easy to run away from our faults and sins, through denial or some kind of a defensiveness that elevates the letter of the law and downplays the spirit of the law. 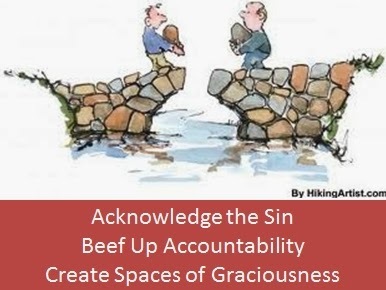 If sinners acknowledge their sin, they are able to come quickly to the throne of grace to take remedial action. Learn to acknowledge our wrongdoing exactly, quickly, and humbly. 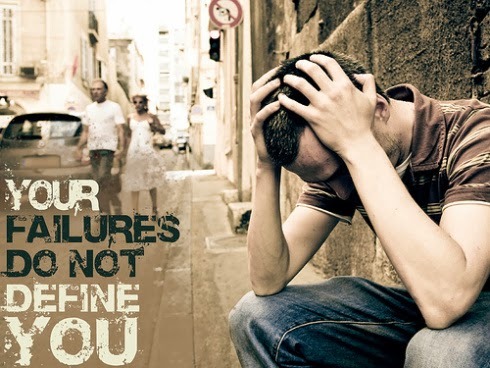 If something had gone wrong, do not make it worse through self-deception and self-denial. At the same time, do not simple admit something and do nothing about it. Beef up accountability levels. It is an important lesson that cannot be missed out. Learn from our own mistakes. Learn from the mistakes of others. Learn to build structures that preserve the integrity of our leaders and organizational integrity. Do not just condemn those who had been convicted. Take care of our own houses, lest we fall. Finally, learn the art of graciousness. Remember that we are weak in ourselves. We have been saved by grace. More importantly, the believer who is sensitive to the Spirit will know that every situation is also an opportunity to know what or what not to do. It can help us learn to become more of a person God had made us to be. This brings us to David Neetham's very provocative thought. It shows us again that punishment for sins is the beginning of redemption, toward greater self identity. THOUGHT: “A Christian is not simply a person who gets forgiveness, who gets to go to heaven, who gets the Holy Spirit, who gets a new nature. A Christian is a person who has become someone he was not before. A Christian, in terms of his deepest identity, is a saint, a born child of God, a divine masterpiece, a child of light, a citizen of heaven, not only positionally, not only judicially, but actually. Becoming a Christian is not just getting something, no matter how wonderful that something may be. It is becoming someone." (David Needham, Birthright ,Portland, OR: Multnomah, 1979, p81).